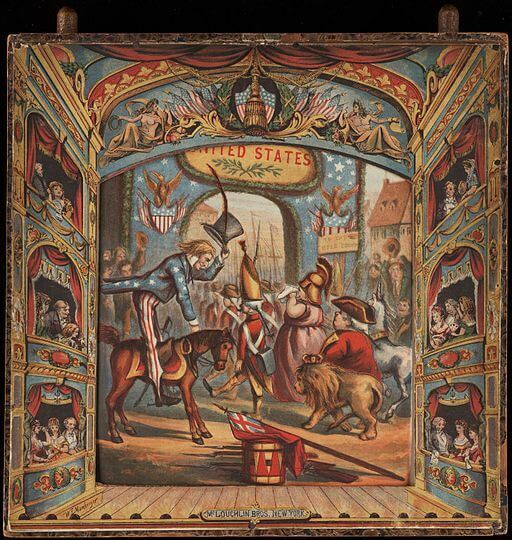 Yankee Doodle (1781) is an earlier version of the patriotic song you might also know, Yankee Doodle Dandy (1904). 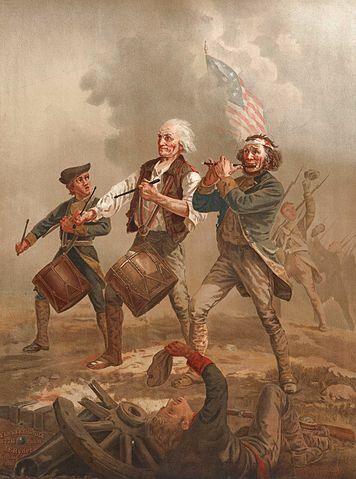 It was sung by British soldiers before the American Revolutionary War to make fun of the sloppy "Yankee simpletons" they served with during the French and Indian War. Americans later adopted it as a song of defiance and support for their Commander of the Continental Army, George Washington. A "dandy" was a man overly concerned with fashion and physical appearance. "Macaroni" described something highly stylish. "Hasty pudding" was an oatmeal mush made with milk and grains (usually corn in America). In spite of its pejorative etymology, "Yankee Doodle Dandy" became a symbol of American patriotic pride, if not a bit self-effacing as well. It is featured in American Patriotic Songs. I wish it could be saved. They eat it when they've a mind to. A load for father's cattle. I thought the deuce was in him. And hung by father's pocket. They scampered like the nation. And called the folks together. He will not ride without 'em. In hundreds and in millions. To give to my Jemima. They 'tended they should hold me. Locked up in mother's chamber. Add Yankee Doodle to your own personal library.